The thirteen-year period from 1981 to 1994 was one of the most prolific for special editions of the Polo. Focused around the more popular hatchback and coupé variants, all were basically base or mid-spec cars with different interior and exterior trim details, wheel designs, unique colours and equipment taken with a ‘pick and mix’ approach. The list below is by no means exhaustive, but typically shows the most popular. The special-edition CX hatchback was launched in April 1983 and featured the 49bhp engine and could count Pearl Silver bodywork, colour-matched alloy wheels and ‘Glencheck’ upholstery among its extra refinements. It was called the ‘Pearl Silver’ on the Continent. The Coupé CX, costing £4,690 featured special ‘Rallycheck’ upholstery on padded seats, the 1043cc engine, 155/70 SR 13 tyres and full sports instrumentation. Costing £4,598, the Polo LX hatchback had low-profile tyres, rear hatch spoiler, twin colour-keyed door mirrors and a 1272cc 55bbhp engine. Interior fitments included a centre console, door pockets, three-spoke sports steering wheel and sports seats trimmed in striking ‘Chintz’ cotton/polyester fabric. The Polo Coupé Boulevard was an-all white model of the Polo coupé and featured colour-keyed bumpers, wheel-arch extensions, hubcaps and front/rear spoilers. Interior refinements included velour carpeting, tinted glass, sports steering wheel and height adjustable driver’s seat. A UK-only model limited to 2,000 examples, it was based on the basic Polo C hatchback, but fitted with the 1272cc 55bhp engine. Extra equipment included roof rails, sports seats, rev counter, digital clock, driver’s seat height adjuster, three-spoke steering wheel, four-headlamp grille and black wheel trim centres. The Twist was based on the base-model Polo’ Standard’ hatchback and featured full-size, flush, colour-keyed wheel trims, twin exterior mirrors, clock and carpeted rear parcel shelf. The Boulevard name was resurrected for the special Polo coupé, and featured colour-keyed bumpers and wheel trims, tinted glass, twin headlights, upgraded stereo and internally-adjustable door mirrors. The Polo Match was introduced in 1989, and was similar in trim to the Twist of 1988. The final special models of the pre-facelifted Series 2 range, the Country was a Polo hatchback fitted with the 1043cc engine and trimmed with such luxuries as tinted glass, five metallic paint finishes, twin headlights, rear window spoiler, glass sunroof and special ‘Country’ rear side window decals. The Parade was a coupé-only model and was available with a choice of 1043/1272cc engines, the latter being available with a five-speed gearbox. Standard kit included tinted glass, twin headlights, rubbing strips and special ‘Parade’ coachline graphics. Like the Boulevard of 1988, the bumpers and wheel-arch extensions were colour-keyed in red or white paint finishes, while cars specified in the two blue colours available had the standard unpainted items of the mainstream models. 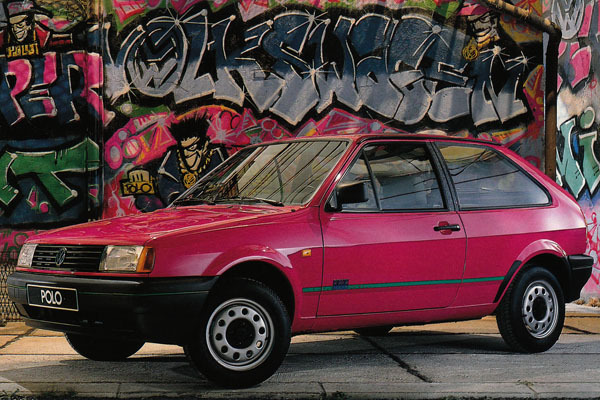 With a palette of four colours, the Polo Mikado offered better value and a more eye-catching look than the base-model Fox on which it was based. Alpine White, Maritime Blue, Tornado Red and special Violet Blue paint finishes contrasted nicely with the unique ‘Harlekin’ blue, grey and red interior trim, and matched the wheel trim rings, which were finished in body colour. Special equipment included an analogue clock, an ‘Alpha’ radio/cassette player and a height-adjustable driver’s seat. Buyers could choose between 1.05-litre 45bhp and 1.3-litre 55bhp petrol engines, or a 1.4-litre 48bhp diesel unit, all shared with the mainstream models in the Polo range. A five-speed gearbox was optional on all Polo Mikados. Resurrecting the Boulevard name yet again, Volkswagen introduced the first UK special edition model of the facelifted Series 2 (2F) for the 1992 model year. Costing £6,948 and available in Caribbean Green or Cerise paint finishes, the 1043cc-powered car came with additions such as an upgraded Blaupunkt stereo, Polo G40 steering wheel, Polo CL wheel trims, centre console, an analogue clock and special interior trim. The Genesis was based on the Fox and was available in both hatchback and coupé variants, with 1043 and 1272cc engines. Extra kit over mainstream models included ‘Modekaro’ upholstery from the Scirocco GTII, rev counter, digital clock, sports steering wheel from the Polo GT/G40, tinted glass, 155/70 SR 13 tyres, removable upgraded stereo and a steel sliding sunroof. The lack of a glovebox lid gave away the car’s base model roots. The penultimate Series 3 special model was another edition of the Boulevard (now in its fourth incarnation). Based on the Fox and priced at £6,995 (£500 more than the base model), the specification included the 1043cc engine, ‘Jubilee’ upholstery, special door pillar trim, lidded glovebox, centre console, door pockets, height-adjustable driver’s seat, passenger sun visor with vanity mirror, upgraded removable stereo and Polo CL wheel trims. Both hatchback and coupé models could be ordered. The final two special editions for Series 2F were run-out models, both of which took names from earlier Series 2 Polo variants. The Match was priced at £5,766 and was based on the 1043cc Fox. Incorporating £640 of extras, the car was available in both hatchback and coupé bodystyles. Additional equipment over the Fox included special ‘Match’ graphics, ‘Sport Räder 1’ alloy wheels, factory-fitted radio and a choice of two new colours. The Parade differed from the Match, as it was based on the higher-specification 1043cc Polo CL. Available in both bodystyles and costing £6,267, like the Match it included £520 of extra equipment which consisted of ‘Sport Räder 1’ alloy wheels, wider tyres, tinted glass, ‘Parade’ graphics, a choice of four new body colours and a Sony radio/cassette with removable front panel. After adding the limited runs of 1986 Series 2 coupé GTG40s and the city vans of 1985 and 1993 to these, it becomes obvious that variety was certainly the spice of the Series 2’s life. Some, such as the Fancy, Shopping and Yes are notable through name alone, while others are more unusual through their rarity – the Polo Laura Ashley (above) was a coupé limited to 300 units with special trim, wooden steering wheel, and Laura Ashley picnic hamper.